Hi everyone, Logan from 1 Plus Armour here. 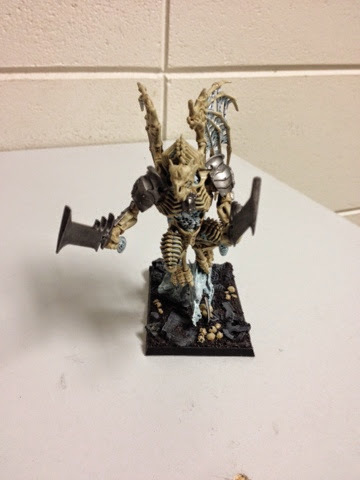 Today I'm showing off my Legions of Chaos army list that I'll be taking to some upcoming events. I won't give away all of the goodies, but I'll include a few blurbs below each picture. I do apologize for the less than spectacular image quality - lighting in my condo is not really conducive to photography. First up, we have my Skullcrushers of Khorne. I'll be running these in a group of 4 with only a musician. Taking a champion feels like a liability primary because against a single wound model (like the unit champion who will accept my challenge) I'll only get 3 attacks before he likely dies, instead of 6 and a stomp! I also generally do not run a Standard Bearer simply because if the unit loses combat and flees it's nearly 100pts lost! Currently I'm using a Exalted Hero of Khorne on a Juggernaut as my Battle Standard Bearer. This guy packs one hell of a punch and is very difficult to kill. With this said, expect to see him replaced by an even meaner variation in the near future! 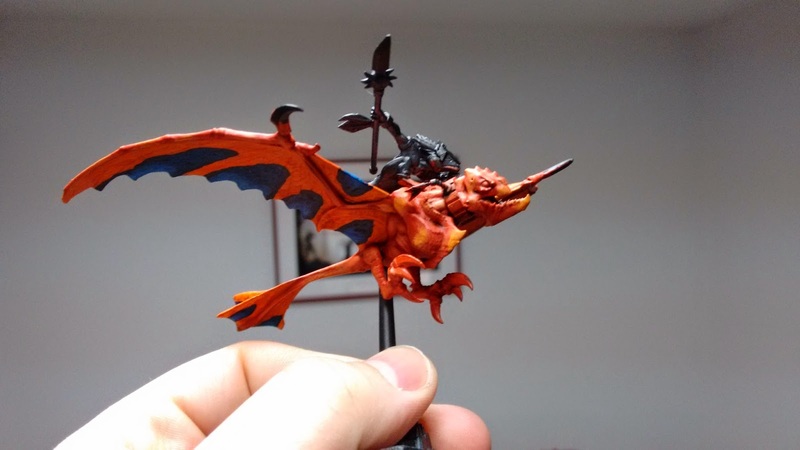 My trusty Sorceror Lord of Tzeentch riding a Disk of Tzeentch. Mobile, extremely hard to kill, and a fantastic chaff/warmachine hunter with Lore of Tzeentch and a not-too-shabby statline of his own. Don't leave home without them now that End Times are here... Two Skullcannons of Khorne. 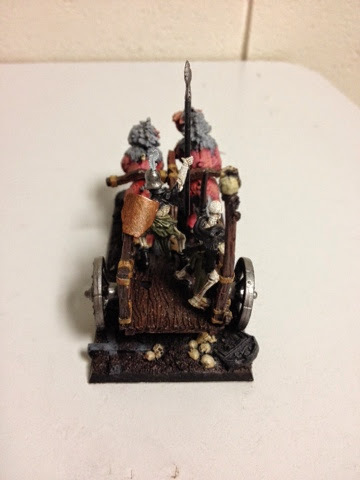 135 points each for something that is on par with my normal Chariots (see below), but also has a ward save, can regenerate wounds, and is a freakin' cannon that can move and shoot!? You'd have to be nuts not to take two of these! 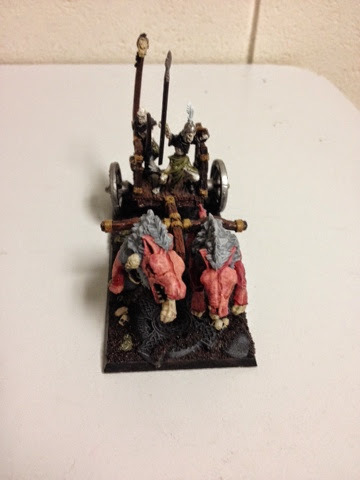 Big block of Warriors of Chaos with Halberds, Shields, and Mark of Nurgle. Very tough to kill and very good at killing things. 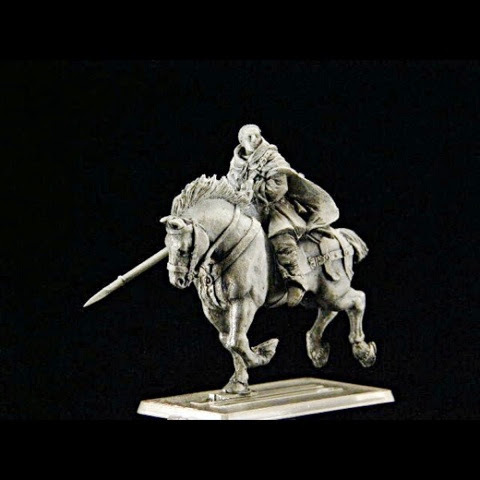 Festus is also in there for some hero sniping with his potions, and to make the unit even stronger with Poisoned Attacks and Regeneration (5+)! 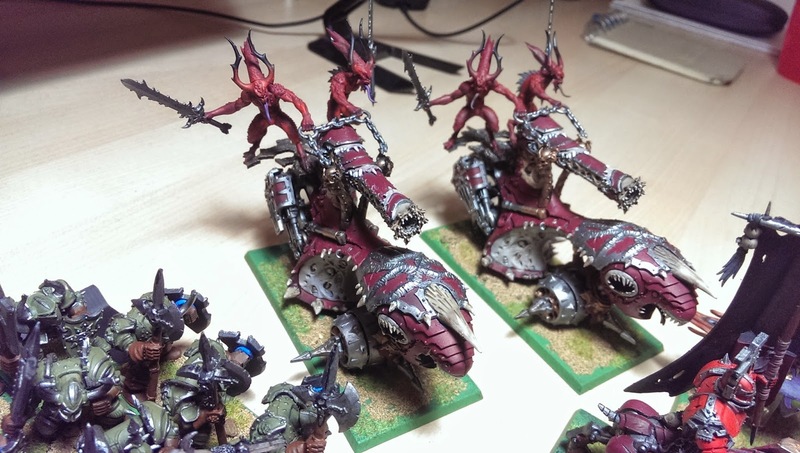 Two Chariots with Mark of Slaanesh. I'll be running a third one as well, however it is not pictured, unfortunately. These guys deliver devastating hits with D6+1 impact hits, and then 4 attacks at WS5 S5 I5. 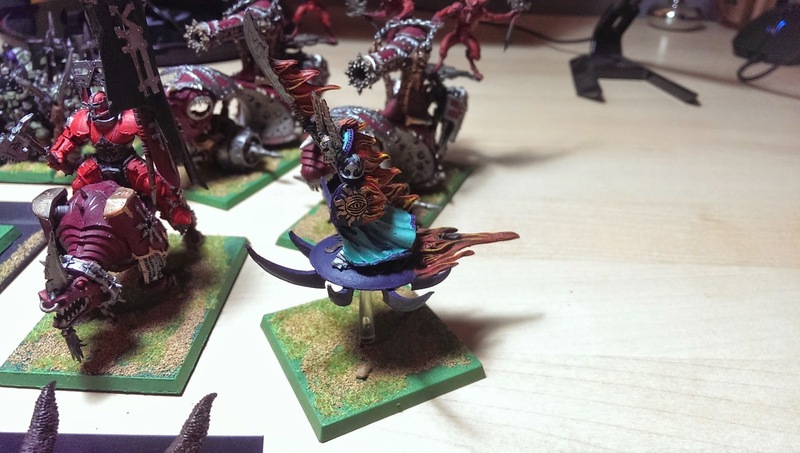 4 wounds, a 3+ save, and the usual Chariot shenanigans make these guys hard to pass up. As a bonus, Mark of Slaanesh makes them nearly impossible to get rid of without some serious attack power coming their way. 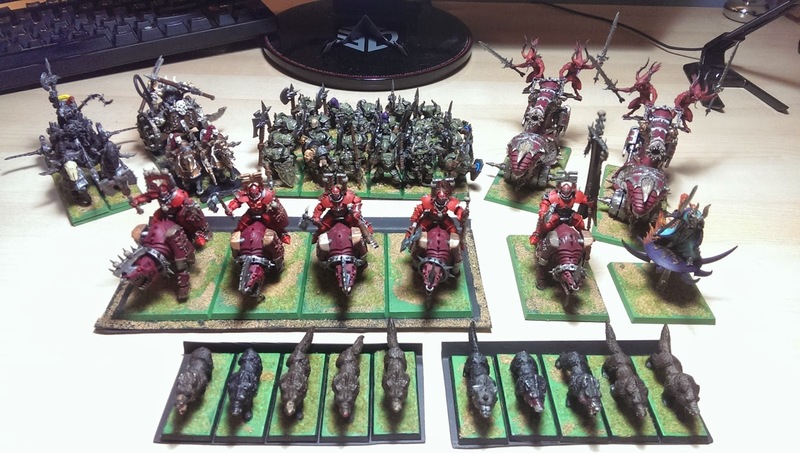 Last but not least we cannot forget about my Warhounds, who are seen at the front of the army here. For 30 points per 5, these guys are great chaff. 14" march means they can disrupt movement and charges right from turn 1. 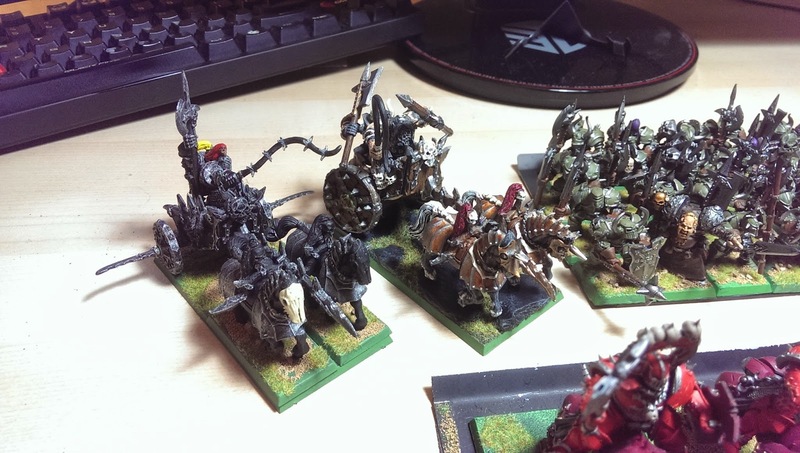 If I had more models, I'd probably run at least 4 units of these guys. 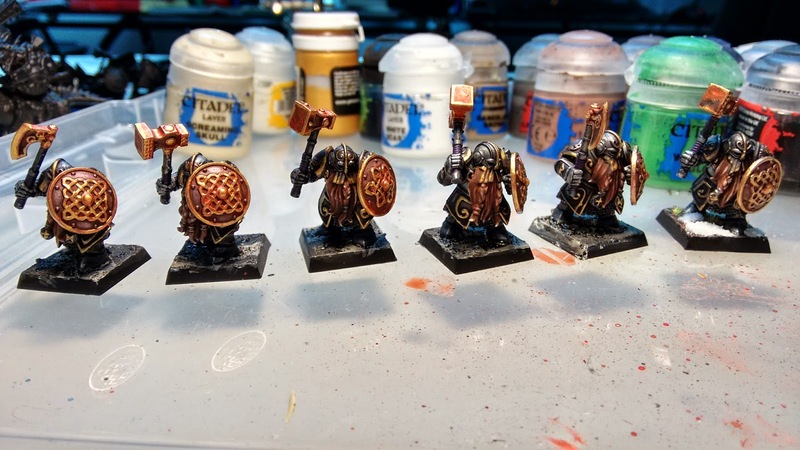 I am by no means a fantastic artist like most of the rest of the guys on the team, but I've tried to keep an old school style going with the army. 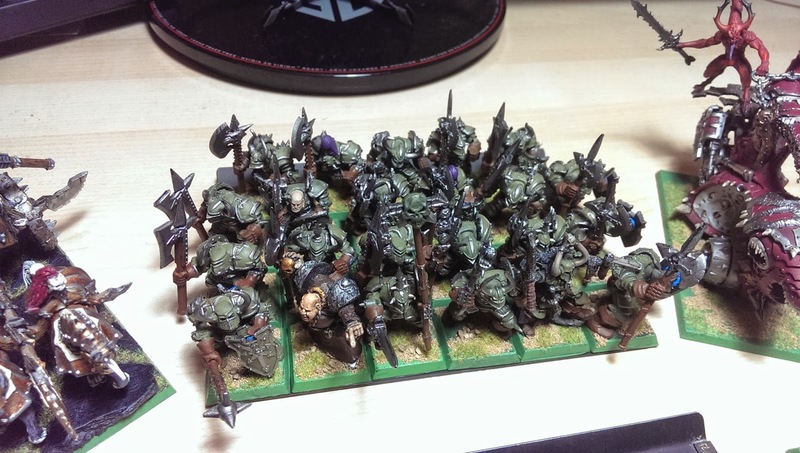 Brighter colours, Goblin Green bases with Static Grass and sand, and consistently using older models to match wherever possible. 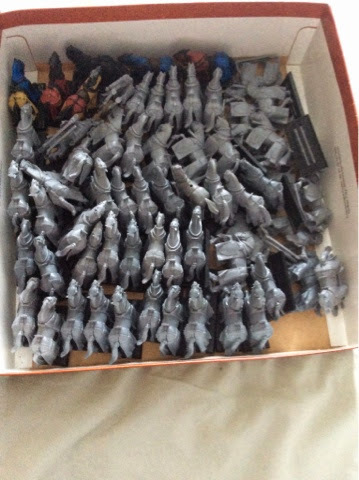 Unfortunately, it is getting quite difficult to find some of the older models (notably chariots), so if you have any to sell please let me know! This is by no means my full collection. 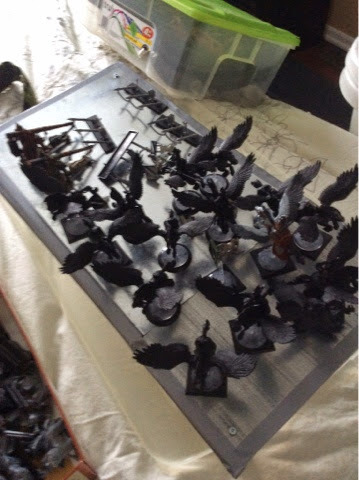 I also have many more Warriors, some monsters, characters... and some Daemon goodies still being built! 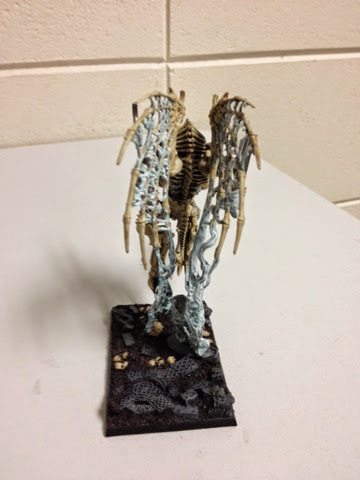 More pictures will come as the army evolves. 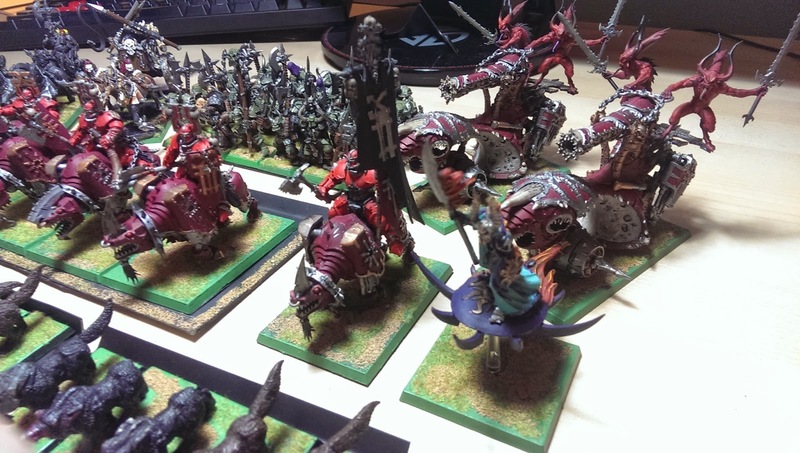 For my next army showcase, I'll take you on a tour of my Vampire Counts (all 5000+ points of them!). Hey hey Swords and Magic fans! The team just want to clarify something for the upcoming Swords and Magic tournament. 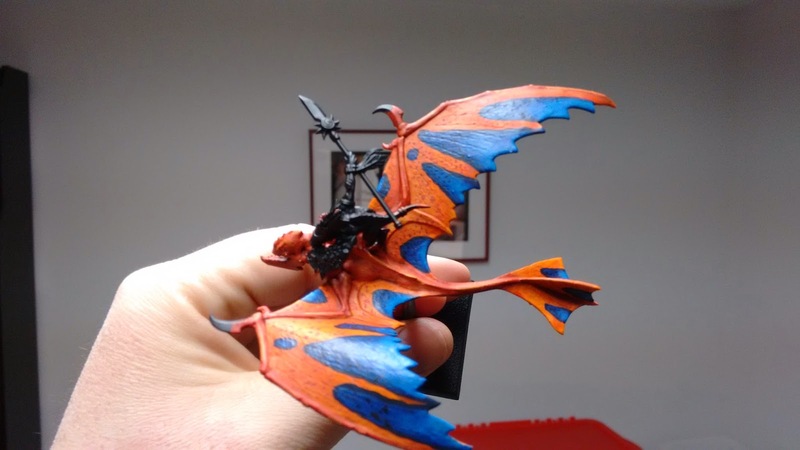 The tournament will not have an army list pre-submission deadline. We will go over the lists the day off. Since most of the attendees are seasoned vets, we don't anticipate any problems. Thanks and see you at the tournament! 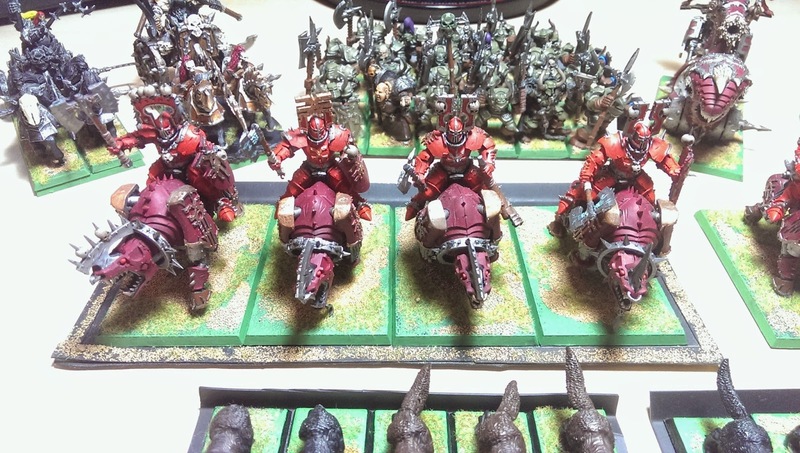 Check out our latest video, filthy stinky Ogres versus the noble Lizardmen! This is also a good showcase on the effectiveness of chaff against deathstar armies. Please enjoy and give us your feedback!